We have already mentioned on the basis of our home-brewed psychological speculations that Schubert and Schober became 'soulmates'. It is therefore no surprise that, now we are speaking of Schober's 'charisma', we note that of all the people in the Schubert circles, Schubert himself was one of those who fell deepest under the spell of the magician. Quite soon in their relationship they merged into a symbolic personage: 'Schobert'. It's just a joke, just another word game among a group of clever young men who are addicted to word games and puzzles, originally used as a way of driving away the tedium of a boarding school, but then later, in a time of censorship and suspicion of all original thought, a way of encapsulating deeper meanings. Except that it is only a joke if there is some reality behind it – like all the best jokes, in fact. The pleasure I had at receiving your letters, both as a whole and individually, cannot be described! I was at an ox and cow auction when your fat bundle of letters was handed to me. I opened it and let out a cry of joy when I saw the name Schober among them. With continual laughter and childish pleasure I read them in a neighbouring room. It was as though I held my dear friends in my hands. Anyway, I shall answer you in an orderly way: Dear Schobert! Schober seems to have been a very infrequent letter writer – certainly, few of his letters have survived. If this is the case and not just a result of historical losses and Schober's own pilfering after Schubert's death, then the psychological team we have advising on this case would point out that socially dominant personalities rarely write letters: they expect to be written to. As the final decade (1818-1828) of Schubert's life rolls by we come across a regular flow of letters from the friends – especially the artist Moritz von Schwind – to Schober during his absences, sometimes on successive days. In the other direction, almost nothing. Perhaps this says more about Schober's obsessive archiving of others' letters, but had there been more correspondence from him we could have expected a certain amount to survive, even with his attempts at later destruction. Schubert not only feels joy at the honour of a letter from Schober, albeit probably ironically, he tells everyone else of that joy without any inhibitions or reservations. He needs to make a public affirmation of that relationship. In the letter we read that the wordplay with the two names has existed for some time and that this letter is therefore a memorialisation of the emergence of the new creature with so much promise: the 'Schobert'. Schober told Schubert's first biographer that he had first heard Schubert's music in 1813 in the Spaun residence in Linz. In his comments on that biography Joseph von Spaun politely but firmly refutes this account in his tactful, civil-servant's prose. In a later undocumented and now lost contribution Schober tells us that in 1815, probably after he had moved to Vienna, he went to visit the composer at the Schubert family home. He found him correcting exercise books and so loaded down with work that Schober wondered how he found the time to produce so much music. However, Schober's 'late-life' wife, Thekla, says that Schober first heard and met Schubert when the latter was singing in a choir. Choose your version. My choice: none of the above. 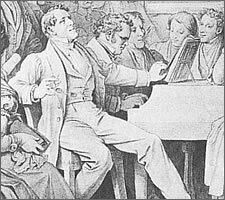 Fleshing out the narrative of his meeting with Schubert with prosaic commonplaces – school drudgery and musical productivity – is characteristic for Schober's technique. The conclusion we are expected to draw from all these contradictory tales is that Schober 'discovered' Schubert and, alone among the friends, 'rescued' him from his grinding drudgery so that he was free to compose. According to Schober, he was touched by Schubert's miserable situation and persuaded him to move in with him for free 'food and lodging'. Schubert's father refused to give his permission for a solution that would be transitory: 'What will happen when you give up on him? He will just be a poor musician'. After much argument Schober persuaded Schubert's father to let his son move in with him. In Schober's patronising narrative, Schubert is represented as a little helpless child (Schubert was, after all, only around five foot tall). Schober, our hero, faces down the tyrannical father and gives the downtrodden musical waif a new home. Most of the elements of the narrative can be found in 'Cinderella'. The hero of the tale is, of course, Prince Charming Franz Schober, who rescues Cinders Franz Schubert from his drudgery. Cinders Franz is not required to contribute his own wishes to this narrative: Prince Charming Franz has everything under control. When Prince Charming Franz arrived home with Cinders Franz he needed to persuade his mother to take in Cinders, but since his mother was a musical sort she soon saw the advantages of having a tame musical genius in the house. Cinders Franz lived with them from the late autumn of 1816 until the summer of 1817. Schobers's account of his rescue of Cinders Franz from teaching drudgery is absurd and we are right to mock it. Schubert's situation as an assistant teacher in his father's school was much more complex than Schober seems to realise. From the point of view of Schubert's father, his permission to run the school [in Rossau] was based on the provision of a certain number of assistant teachers. In his application he had made much of the 'skillset enhancement' arising from the presence of a musical genius among those teachers. When his son left he would have had to find and pay a replacement and hope that the authorities did not notice that the musical genius was no longer on the staff. From Schubert's point of view, leaving the safe haven of the school was not without risk. It is probable that it was his short stature and short-sightedness that saved him from conscription into the army, but his position as an assistant teacher in his father's school was an additional protection. Once he gave up that job his status in the Austrian Empire was dangerously close to 'vagrant'. With the tacit agreement of his father he seems to have kept a nominal position as a schoolteacher for some years after he left: when the police interviewed him during the Senn affair in 1819 he wisely gave his occupation as 'assistant teacher'. Schober's silly, self-aggrandising tale is not just a harmless fairy story. It has become one of the elements in the persistent view of Schubert's father as a Gradgrind, an unimaginative dullard who failed to see his composer son's potential or support him in developing it. In this view, Schubert's father is the one who chained the composer's wingèd horse to the ground. In reality – at least as far as we can guess at it – Schubert senior may have been someone who, in his own words, 'enjoyed moralising', but he was not a tyrant. He had severe limitations placed on his conduct and lifestyle by his priestly employers and had to survive under Franz II's school censorship regime. He had built his own career up from nothing, partly by luck but mainly by drudgery. He had managed to get his son a respectable education, in much the same way that his father had lifted him and his brother from the flax fields of Moravia via the Jesuit school in Brünn. Schubert and his brothers grew up in a close and supportive community in which his father seems to have been greatly respected. Furthermore, Schubert senior's fears for his son's future were quite justified. In music-mad Vienna, instrumentalists and composers were two-a-penny – few had secure positions, most were part-timers or amateurs. It is therefore actually quite repellant to find the restless butterfly Schober, the moneyed dilettante who barely finished anything, smearing Schubert's father so freely for the purpose of enhancing his own reputation as the composer's saviour. Although the Schober family fortunes had declined dramatically, as we have noted, Franz Schober had access to liquid reserves that his friends could not match. Not only was he supporting Schubert, but a number of other friends, even the Spauns, took out loans with him. Kind hearts will be warmed at his financial support of his struggling friends; grumpy misanthropes such as your author suspect the true purpose was purchasing respect and making oneself indispensable. Whilst the reliable Spauns found paying back these loans a great struggle, there can have been no realistic expectation of Cinders ever paying them back. On this point I'm with Schubert's father. For indeed, when it looked as though Axel Schober would return from the army in 1817, Cinders had to leave. Axel had fallen ill with Lungenschwindsucht (tuberculosis) in March in Alsace and wanted to return home to recuperate. He left Colmar at the end of August but never made it, dying en route on 6 September in Dillingen an der Donau, in Swabian Bavaria, where he was buried. It seems likely that Franz Schober travelled to Dillingen to retrieve Axel's belongings, but this is just an assumption: even in such a relatively simple matter the Schober cloud of unknowing descends and we have to admit that we have no evidence to show that Franz von Schober went to Dillingen. In August and September 1816 Schober visited Sweden. In Schober's biography even the simplest things become confused and blurred. We are told that the journey, undertaken with a maternal uncle, was connected with some financial transaction or inheritance matter. Torup Castle had been sold four years before this and we wonder whether he would have been able to stay there. Anton Ottenwalt, the eventual winner of the hand of Marie von Spaun, wrote to him, puzzled at what financial task he had to perform, since, in his opinion, the last person one would involve in a financial negotiation would be Franz von Schober. Ottenwalt suspects, as does your grumpy author, that Schober was really just going along for the journey to his former Swedish home. We would point to that exotic home as the root source of his psychologically invaluable 'otherness'. The fact that Schober decorates himself to his friends with the task of regulating some important financial matter says a lot about his need for recognition – the Viennese psychologist Alfred Adler told us all about such combinations of Minderwertigkeitskomplex, 'inferiority complex', with its 'compensation' a Geltungsstreben or Geltungsbedürfnis, a 'need for recognition'. These traits were, after all, the basis of life in the feudal society of the Austrian Empire and consequently we are not surprised that firstly, it is a Viennese psychotherapist who first identified them and secondly, that the uniquely repressed and repressive psyches of the inhabitants of that empire should form such a fertile ground for the greats of psychotherapy. Leopold Kupelwieser, Franz von Schober [ND], Wienmuseum, Austria. Torup castle is in the background, taken from a sketch of Schober's. The well-known portrait of Schober by Kupelwieser that was probably painted around 1820 has him posing in front of Torup castle, based on a sketch that Schober had presumably made during his visit to Sweden. It seems unlikely that Schober senior actually owned Torup Castle, meaning that the castle in front of which his son is posing may be technically his son's birthplace but is in no sense a Schober dynastic possession. The Schobers had occupied it barely more than 15 years. Since the death of Schober senior in 1802 the castle had become increasingly decrepit. It had been sold in 1812, after the 1811 peasants' uprising in the region which had briefly driven Baron Stiernblad out of the castle. The uprising was put down with exceptional brutality soon afterwards. Perhaps the renovations had been finished by the time Schober was there. What will become of him? – that is the painful thought, that I can see his future ahead of him, the blooming, talented, dear young man, damaged in the noblest elements of his being, without self-confidence, without the energy of youth, joyless and hopeless – just in the years in which the human being should be creating and enjoying the happiness for life. I am very afraid that he will come to little; the flower has been spoiled; from where will the fruit come? It is not a single passion that has caused this, just so little as in Goethe's Werther, to whom he bears a tragic similarity and which is therefore his favourite book. Quoted in Waidelich Torupson p. 45. The reference to Werther, the hero of Goethe's scandal novel of 1774 Die Leiden des jungen Werthers 'The Sorrows of Young Werther', is very revealing. Not just the hero's suicide – at that time regarded as a dreadful sin – but the raging passions for the unattainable combined with the brooding atmosphere of alienation and Weltschmerz within the book made it an instant and long-running publishing success despite the attentions of censors throughout Europe. It was the book of the age. Goethe had touched a nerve in that Zeitgeist of bubbling eroticism, official religious morality and rigid social convention. It was felt that the glamour of the book would drive some tormented souls to imitate Werther's exit. Probably rightly, since even today psychologist's talk of the 'Werther-Effect'. The novel spawned its own genre in German literature: the Wertheriaden, or Werther imitators. Schober's Kremsmünster schoolfellows had compared his raging passions for the unattainable in respect of Marie von Spaun to those of Werther. We are told Schober was planning to stab himself to death, presumably having no access to Werther's pistol in the school. His sister Ludovica's end had echoes of Werther, too. However, if she did kill herself – bullet or no bullet – she did it more efficiently than Werther did, who took exactly 12 hours to succumb to his pistol shot. But, in the end, Schober didn't become Werther: dilettante Schober was a dilettante Werther – he just acted becoming Werther, acting for an audience, as he would do for the rest of his life. 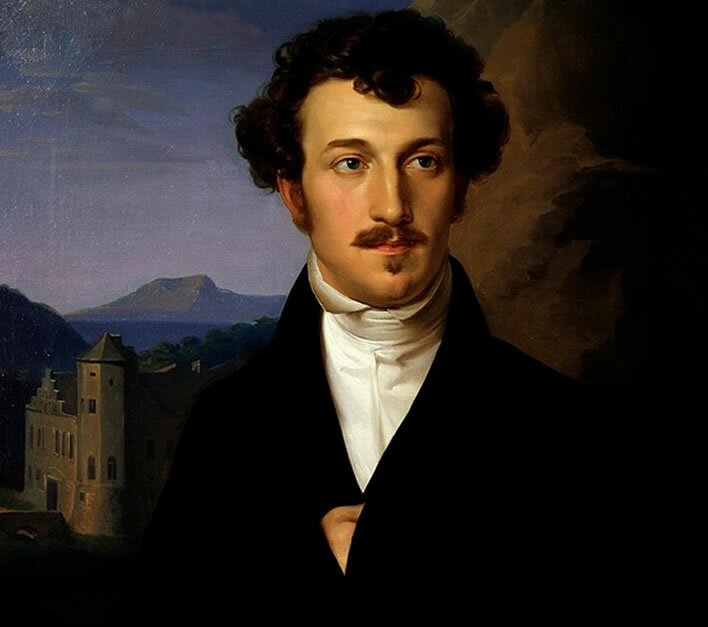 In 1816 this man became Franz Schubert's closest friend and supporter. From the biogenesis of the two a new life form has emerged. The poor, driven, musical genius has fused with the rich, dilettante Werther to make the 'Schobert'.